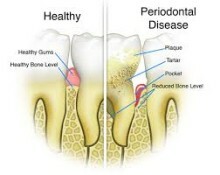 Periodontal disease (also known as gum disease) is an infection of the gum and bone that holds teeth in place. They often are painless and you may not be aware that you have a problem until your gums and the supporting bone are seriously damaged. The good news is that periodontal disease often can be treated in the early stages with scaling and root planing (“deep cleaning”). Our doctors plan an appropriate periodontal program for each patient that will ensure a successful treatment outcome. There are times where we will work in conjunction with a Periodontist, a gum specialist, to ensure our patients get the best care possible for their teeth and gums. It is important to know that not only is it the number one reason for tooth loss, research suggests that there may be a link between periodontal disease and other diseases such as, stroke, bacterial pneumonia, diabetes, cardiovascular disease, and increased risk during pregnancy. Researchers are determining if inflammation and bacteria associated with periodontal disease affects these systemic diseases and conditions. Smoking also increases the risk of periodontal disease.